Slaven Bilic has been sacked as West Ham manager with former Everton and Manchester United boss David Moyes set to replace him on an interim basis. Bilic, 49, departed with the club in the Premier League relegation zone. His last game in charge was Saturday's 4-1 defeat by Liverpool at London Stadium. West Ham said the club believed a change was necessary "to move forward positively and in line with their ambition". Speaking to reporters as he left West Ham's training ground, Bilic - who was appointed in the summer of 2015 - said: "There are no hard feelings. I can be very proud of my work here. "We didn't start this crucial season well. As in many clubs across Europe, the manager is the one who pays the price. It's a very logical move." With 11 league matches gone, he is the fourth Premier League manager to leave his job this season following Frank de Boer (Crystal Palace), Ronald Koeman (Everton) and Craig Shakespeare (Leicester). A statement from joint chairmen David Sullivan and David Gold said Bilic had conducted himself with "honesty and integrity" and the decision to sack him had been made "with disappointment and heavy hearts". "We see this as an exciting opportunity to appoint a quality manager to the position to inject fresh ideas, organisation and enthusiasm into a very talented squad," they said. West Ham say Bilic's coaching assistants Nikola Jurcevic, Edin Terzic, Julian Dicks and Miljenko Rak have also left the club with immediate effect. Chris Woods, who was goalkeeping coach under Moyes at Everton and United, is the only member of the coaching staff to remain. A club statement said: "The search for a new manager to take West Ham United forward is under way and an announcement regarding Bilic's successor is expected to be made over the coming days." Former Croatia defender Bilic guided West Ham to seventh spot in his first season in charge, but an 11th-placed finish last term, their first at London Stadium, has been followed by a poor start this season. The Hammers are 18th, having won just two Premier League matches in 2017-18 - and lost their first three league games of the campaign. "We will now focus our entire efforts on bringing in the manager we believe can get the best out of the current squad of players and steer the club towards the top half of the table as quickly as possible," said Gold and Sullivan. West Ham's next match is at Watford on Sunday, 19 November. Is Moyes the man for Hammers? BBC Sport understands West Ham held talks with Moyes while Bilic's future was being reviewed. Speaking to Bein Sports on Sunday, the Scot denied there had been contact, but said he wanted to return to club management and was "interested" in the West Ham job. Moyes said: "I've always said I want to go back into club management. If the right opportunity comes around, I'll be interested." His most recent managerial job was at Sunderland - he resigned after they were relegated to the Championship in May. Asked specifically about West Ham, the 54-year-old said: "I am interested but at the moment that vacancy has not become available. I know what Slaven must be going through." Alan Irvine, Moyes' former assistant at Everton, could be a candidate to join the Scot should he get the job. Former West Ham striker Dean Ashton told BBC Radio 5 live that Moyes was "the safe option if you're thinking about grinding out until the end of the season and safety". But he added: "As a player, David Moyes coming in wouldn't inspire me." 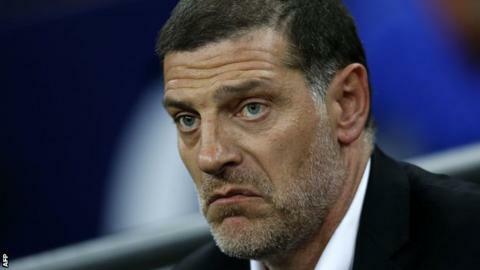 Bilic - who previously managed his country for six years - spent a reported £42m on players in the summer. That included the signings of forward Marko Arnautovic from Stoke City for a club record £20m, and former Manchester United striker Javier Hernandez from Bayer Leverkusen for £16m. However, his side have taken just nine points from 11 league matches, conceding 23 goals in the process. They endured a poor start to last season, winning just two of the first seven Premier League home games after moving into London Stadium, and suffering heavy defeats by Watford (4-2), Southampton (3-0) and Arsenal (5-1). However, Bilic eventually guided the club to a mid-table finish and his record compares favourably with his predecessors, with none having claimed more Premier League points per game. There's a general consensus that Slaven Bilic's time was up, even among those who have supported him throughout his tenure at the club. The fans seem quite unanimous in that they are not particularly keen to see Moyes come in. They would prefer to see someone more progressive. I suspect there would be an awful lot of criticism for the board, who are already under intense pressure following the move to the Olympic Stadium, which has not gone down well. Various reasons have been mentioned, including his record at Sunderland, where he came in at a similar position and failed to keep them in the Premier League. There was also the incident with the female reporter which has been mentioned a few times. Are West Ham fans ever truly happy? I don't know. I saw Guus Hiddink mentioned on Twitter. Whether that's the sort of calibre of manager we could attract, I'm not convinced. It would have to be someone from that top tier to give West Ham fans some sort of confidence we can survive and stay in the Premier League next season. David Moyes' appointment as West Ham's new manager is likely to be confirmed within the next 24 hours. Moyes returned from a trip to Qatar, where he did some work as a TV pundit, on Monday morning. It is understood contact has been made with the Scot, who has already said he would like the chance to take over. Although the prospect of Moyes' arrival has not been positively received by many Hammers fans following disappointing stints at Manchester United and Sunderland, West Ham owners David Sullivan and David Gold view him as someone who will get the club moving in the right direction again. In particular, Moyes' work on the training ground is seen as having the potential to get more out of an underperforming group of players.